Fox Illusion (フォックスイリュージョン, Fox Illusion) is Fox's side special move. The move first appeared in Super Smash Bros. Melee, and returns in all subsequent Super Smash Bros. installments. Performing the attack sends Fox darting forwards with incredible speed, which causes an afterimage effect and hurts any enemies in his path. It deals little damage (3%) and has very little knockback, however, if a foe gets hit with it at over 295% (such used in Sudden Death), he/she will be instantly launched upwards and get inevitably KO'd. In Melee, the dash is so fast that if used facing an edge at the end of a stage, the attack will cause Fox to dart over the ledge, resulting in going into the helpless state, and usually causing a self-destruct. This was removed in Brawl. In Super Smash Bros. 4, the move can no longer go over a grabbable ledge, and no longer puts Fox in a helpless state, and in Super Smash Bros Ultimate, the move loses the ability to pass through shields. The move may also be used by players as a useful recovery technique, since the move can quickly cover about half of the length of Final Destination and makes up for a faster option than Fire Fox. However, compared to Fire Fox, Fox Illusion only has 1 angle of travel and gives less momentum and maneuverability after the dash despite technically covering more distance. Because of the speed Fox travels during the move, he is capable of skipping through attacks with slow-moving and/or small hitboxes, resulting in the impression that the move gives him invincibility or intangibility. Fox Illusion, along with Falco Phantasm and Wolf Flash, can be shortened by pressing the special button while or right before Fox is moving. The length to which the move shortens depends on the timing of the button press. Specifically, for Fox, there are five shortening lengths, 1 for each of the 5 frames he is traveling. Since shortened side-special moves require opponents to time their attacks differently in order to edgeguard Fox, these variants can be used as highly effective mix-ups for recovering. Fox can no longer do this in Super Smash Bros. 4. "Dash through opponents at great speed to knock them into the air." "The dash itself deals no damage, but an explosion occurs where you stop." "Dash into the air at an angle. When it hits, it sends opponents crashing downward." Fox Burst: Decreases the travel distance and the dash does no damage, but creates an explosion at the end of move, and allows Fox to stall when used in midair. The explosion deals 13% damage, decent knockback, and some shield damage. Wolf Flash: Travels less horizontal distance than Fox Illusion, but has a vertical element added to it, and does 3% damage and minor knockback unless Fox hits with the sweetspot at the end of the move, which does 9% damage and can meteor smash or send opponents flying upward. Fox Burst being used in Super Smash Bros. for Nintendo 3DS. The impact of Fox Burst. Wolf Flash being used in Super Smash Bros. for Nintendo 3DS. 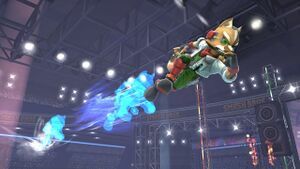 Fox Illusion is an exclusive move to the Super Smash Bros. series, but it may have been inspired by the Arwing's ability to fly at lightspeed after traveling through warps in Meteo and Sector X in Star Fox 64. Fox Illusion can be a quick recovery move with great horizontal distance. Fox using Fox Illusion to stall a ledge in Melee. Fox using Fox Illusion in Super Smash Bros. for Nintendo 3DS. Fox Illusion as shown by a Skill Preview in Ultimate. In Ultimate, the afterimages uses Fox's design from the Wii U version of Smash 4. This page was last edited on April 8, 2019, at 21:45.